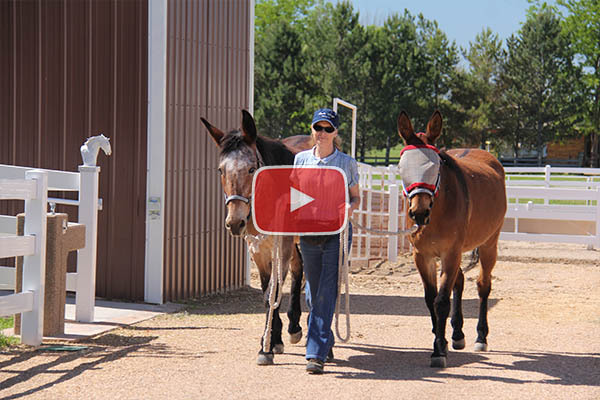 In response to letters and emails from people with training and behavior questions about their equines, Meredith has created a series of short training tip videos to help address some of these common issues. Be sure to check out the Detailed Descriptions if you’d like the printable guide that goes along with each video. Make sure to subscribe to our channel on YouTube to get alerted of new training tips. 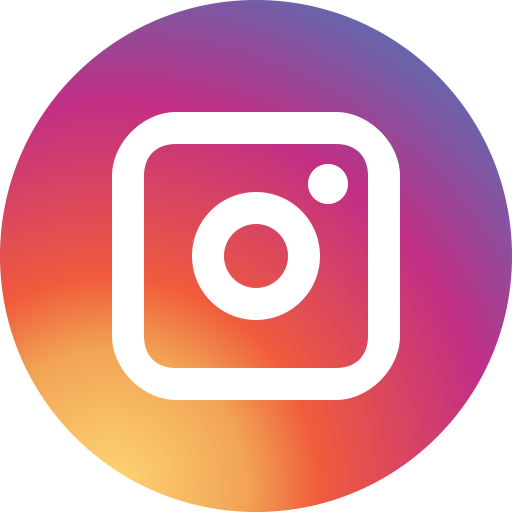 If you have a training question or an idea for another Training Tip video, check out the Ask Meredith section for commonly asked questions, or click here to submit your question. 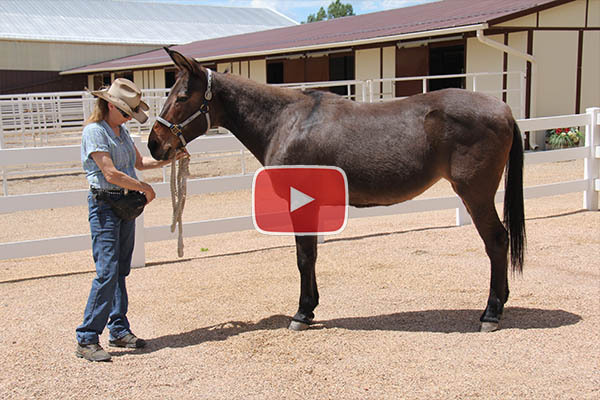 Your horse, mule or donkey isn't born with good posture--so Meredith has some tips on how you can ensure he's moving his body properly as you train. And check out the bonus Training Tip Detailed Descriptions! Each Detailed Description explains the subject of the video in a bit more detail and depth, including additional photos. These documents are each about 2 - 4 pages long, and they make it easy to print out the basics of the lesson to read and study offline. This Detailed Description covers information discussed in Training Tip #11 - The Importance of Good Posture. To watch the video full-screen, click the icon in the bottom right corner of the player that looks like: [ ]. 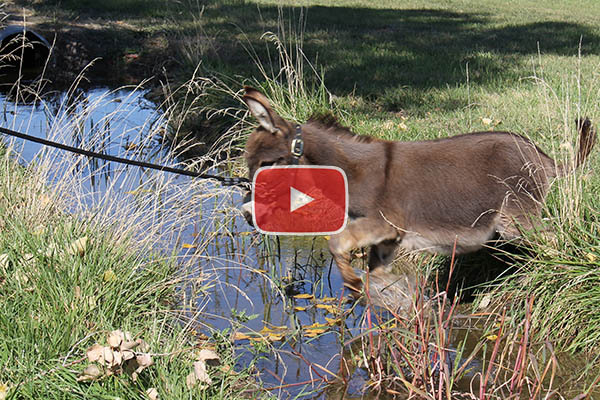 Training miniature equines is similar to their larger brethren, but often requires special approaches to make them comfortable. Find out how to best work with your mini in “Getting Down with Minis.” And check out the bonus Training Tip Detailed Descriptions! Each Detailed Description explains the subject of the video in a bit more detail and depth, including additional photos. These documents are each about 2 - 4 pages long, and they make it easy to print out the basics of the lesson to read and study offline. This Detailed Description covers information discussed in Training Tip #18 - Getting Down with Minis. To watch the video full-screen, click the icon in the bottom right corner of the player that looks like: [ ]. 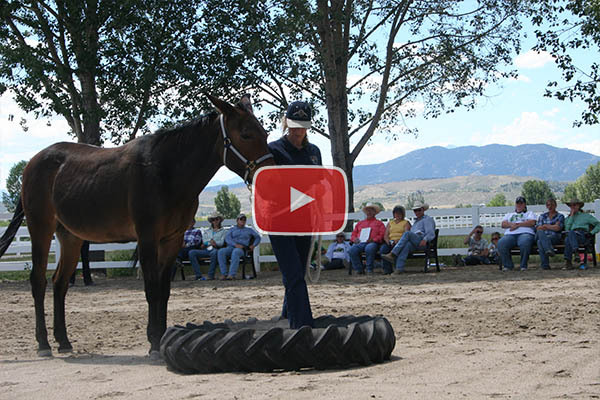 Leading training on the obstacle course is your equine’s initial exposure to real fear. Meredith explains how to turn that initial fear into a curiosity that will positively guide your equine’s future interactions with the world! This Detailed Description covers information discussed in Training Tip #19 - Turning Fear Into Curiosity. When training any equine at any stage, going slowly and being clear and consistent in your approach is a more rewarding—and much safer—way to train for both you and your equine. This Detailed Description covers information discussed in Training Tip #20 - Going Slowly. Including good manners and routine practices while teaching gate training makes your job—and your equine’s—a lot easier, now and far into the future. This Detailed Description covers information discussed in Training Tip #22 - Gate Training. The key to leading your equine correctly is consistency—learn how to use leading cues correctly and consistently in this training tip. This Detailed Description covers information discussed in Training Tip #25 - Leading Correctly. There are many advantages to having an equine that can square up at the halt, because that means he is putting equal weight over all four feet for ideal balance and good posture. This Detailed Description covers information discussed in Training Tip #28 - How to Square Up. In order for your equine’s body to be properly balanced, it’s important to fine-tune all movements and make them as steady, balanced, and coordinated as possible. This Detailed Description covers information discussed in Training Tip #29 - Walking Straight Lines. A supple equine is a pliable, self-confident and healthy equine. That is why it’s so important that he learns how to properly bend through his rib cage. The benefits will be enormous and will last a lifetime. This Detailed Description covers information discussed in Training Tip #30 - Bending Through the Rib Cage. Equines are not born with an awareness of their own bodies, or proprioception, so they must be taught how to orient themselves. This Detailed Description covers information discussed in Training Tip #31 - Proprioception. For your equines to perform their best, they need to have even weight distribution and efficiently utilize balanced movement in their bodies. This Detailed Description covers information discussed in Training Tip #32 - Good Posture and Performance. By planning every move and being consistent, you can reinforce your equine's good posture—until it's a natural state for them. This Detailed Description covers information discussed in Training Tip #33 - Plan Every Move for Good Posture. Training sessions that are too repetitious and last too long will only fatigue and frustrate your equine, resulting in unwanted resistance. Keep lessons short and easy for the best training results. This Detailed Description covers information discussed in Training Tip #34 - Keep Lessons Short and Easy. Conducting your leading training on flat ground first is the best way to build strength in good equine posture for symmetrical muscle development. This Detailed Description covers information discussed in Training Tip #35 - Leading for Ideal Muscle Development. One of the most difficult things your equine will ever learn is to stand perfectly still while the show judge inspects him. This Detailed Description covers information discussed in Training Tip #37 - Showmanship Judging. There is a common misperception that “Showmanship” is just a class at an equine show, but the truth is that showmanship training is beneficial to your equine any time. This Detailed Description covers information discussed in Training Tip #38 - Showmanship Is Not Just for Show. If you are going to attend a show, it is advisable to get a copy of the rulebook that is designated by the show committee, so you know what to expect for each class you enter. 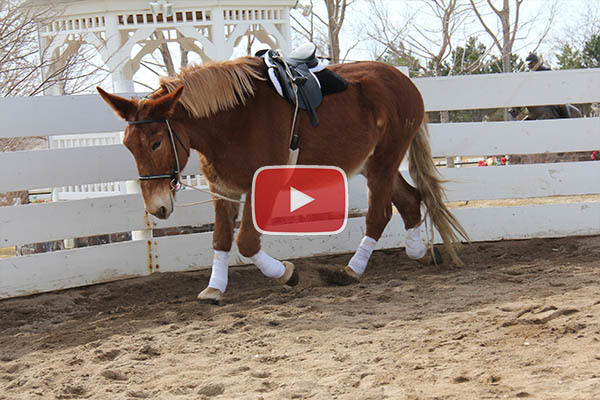 The turn on the haunches can be a complicated move for your equine. Learn how to approach the move in this Training Tip. And check out the bonus Training Tip Detailed Descriptions! Each Detailed Description explains the subject of the video in a bit more detail and depth, including additional photos. These documents are each about 2 - 4 pages long, and they make it easy to print out the basics of the lesson to read and study offline. This Detailed Description covers information discussed in Training Tip #40 - Turn on the Haunches. To watch the video full-screen, click the icon in the bottom right corner of the player that looks like: [ ]. 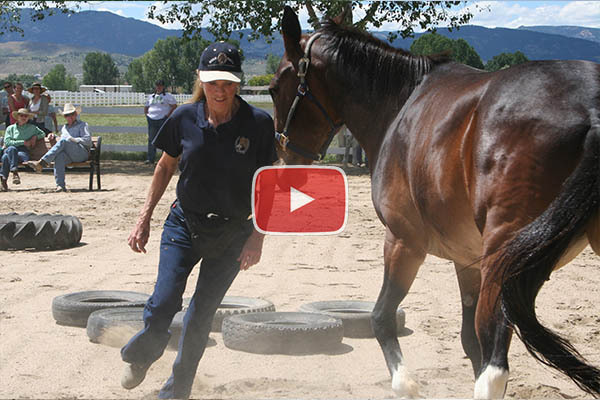 Meredith demonstrates how to teach your equine to execute a turn-on-the-forehand on the lead line. And check out the bonus Training Tip Detailed Descriptions! Each Detailed Description explains the subject of the video in a bit more detail and depth, including additional photos. These documents are each about 2 - 4 pages long, and they make it easy to print out the basics of the lesson to read and study offline. This Detailed Description covers information discussed in Training Tip #41 - Turn on the Forehand. To watch the video full-screen, click the icon in the bottom right corner of the player that looks like: [ ]. 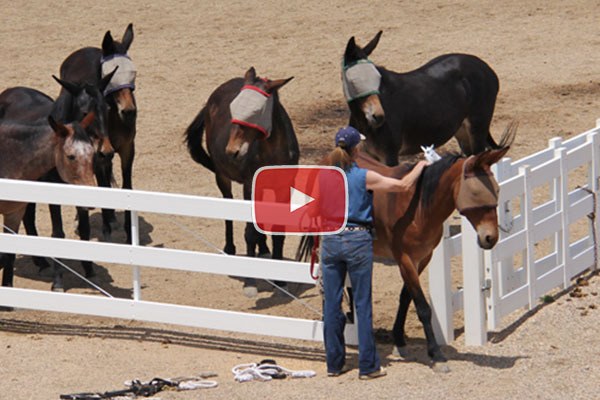 Leading with purpose will keep your equine’s responses attentive, prompt and smooth. This Detailed Description covers information discussed in Training Tip #42 - Leading Purposefully at the Walk and Trot. Whether or not your equine is calm enough to really stand still depends on all the lessons he has had and how they were executed. This Detailed Description covers information discussed in Training Tip #43 - Teaching Your Equine to Stand Still. Learn how to lead your equine through forward obstacles in order to instill confidence and turn your equine’s fear into curiosity. And check out the bonus Training Tip Detailed Descriptions! Each Detailed Description explains the subject of the video in a bit more detail and depth, including additional photos. These documents are each about 2 - 4 pages long, and they make it easy to print out the basics of the lesson to read and study offline. This Detailed Description covers information discussed in Training Tip #44 - Leading Through Straight-Forward Obstacles. To watch the video full-screen, click the icon in the bottom right corner of the player that looks like: [ ]. Learn how to lead your equine through forward obstacles in order to instill confidence and turn your equine’s fear into curiosity. This Detailed Description covers information discussed in Training Tip #45 - Leading Through Lateral Obstacles. If leading lessons aren't working, try asking yourself these questions to figure out what's going wrong. This Detailed Description covers information discussed in Training Tip #46 - When Stage Two Leading Lessons Aren't Working. Side passing the "T" is an advanced move, and a good challenge for testing your equine's lateral abilities. This Detailed Description covers information discussed in Training Tip #47 - Side Passing the "T". 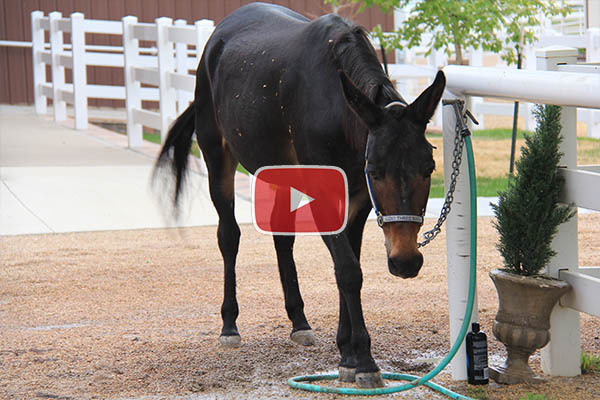 Is your equine ready to start lunging training? And are you? Ask yourself these simple questions—before you get into the roundpen—to make sure. This Detailed Description covers information discussed in Training Tip #48 - Preparation for Lunging.